The other day someone asked me where I would like to travel to and after some thought I came to the realization that there is now only one country left for me to visit, well maybe two. Having a European background, having been raised there and having seen lots of it, there is no country left on that continent that I would visit again. Not just because I have seen enough but the political and socio-economical landscape has so changed that it no longer appeals to me, with the exception of visits to my home country, the Netherlands, to see friends and family. Travel is no longer what it used to be. Flying has become a hassle. As we all know airplane seats are now so narrow and give so little legroom that long flights have become uncomfortable. Check in times are so long that you can spend a full day at an airport before your flight leaves (considering so many flights are delayed). Flights are too crowded. I could go on and on. And, then there are the tourists. November 2017 saw a ban on huge cruise ships in Venice’s lagoon. They seem to be everywhere! And not just a handful, but busloads full, cruise ships full. Poor Venice is sighing under the stress of thousands of passengers off loaded from gigantic, monstrous cruise ships.The scale of these ships in comparison to Venice’s buildings is preposterous, ridiculous. I don’t blame the Venetians for staging protests to get these ocean monsters out of their beautiful waters and wanting to take their city back. A similar fate has befallen Amsterdam. These days the city is packed with tourists. The main streets are chock full with people. The stores which once served the local population have closed and instead souvenir shops have opened up. Homes are rented out on Airbnb rather than locals. Greed is at the heart of all this. One of the most beautiful towns in the Netherlands, Giethoorn, is experiencing the same craziness as Amsterdam and Venice. A quaint, tiny town, it receives nearly a million visitors a year, mostly Chinese. Considering that Giethoorn has no roads, only narrow waterways and plots of land with homes and foot paths, this can be a real challenge. People get about by small boats. Tourists are in 20 feet long barges, clogging the waterways. Most homes have thatched roofs and are centuries old. However, when you have tourists trampling through your front yard, peeking through your windows because your home is so enchanting to them, the words tourist and tourism take on a whole different meaning! But, back to the original question, where I would like to travel to. I realized that I would only like to visit Israel and South Korea at this point in my life. Israel because it has special meaning to me. South Korea because my daughter-in-law hails from there. For the moment and for the purpose of this design blog I will only focus on Israel today and a couple of its amazing architects and designers. First lets visit Tel Aviv. Tel Aviv means Spring Mound. Aviv or Spring symbolizes renewal, whereas Tel or Mound reflects layers and layers of civilization and symbolizes the ancient. The southern part of the city is the old port of Jaffa. Jaffa was the home for both Jews and Arabs in the early 1900’s. Tel Aviv grew as a new, modern city right next to Jaffa after 1948 when Israel was established, to the degree that Jaffa is now the southern section of the city. 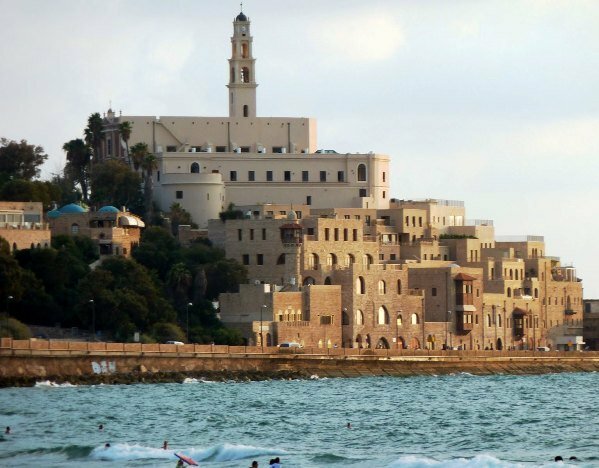 While Jaffa showcases old and ancient homes, with its narrow, winding streets and interesting shops, Tel Aviv is a modern, thriving city known for its Bauhaus style architecture. One of its neighbourhoods is called the White City which houses the largest collection of Bauhaus style buildings globally and which is a UNESCO World Heritage Site. In the 1920’s and 1930’s many European Jewish architects moved to Tel Aviv where they practised what they had learned, adapted to Israel’s Mediterranean climate. The result was a rich tapestry of buildings which have been lovingly restored in the last while. The old port of Jaffa is being gentrified by amongst others the firm Pitsou Kedem Architects. 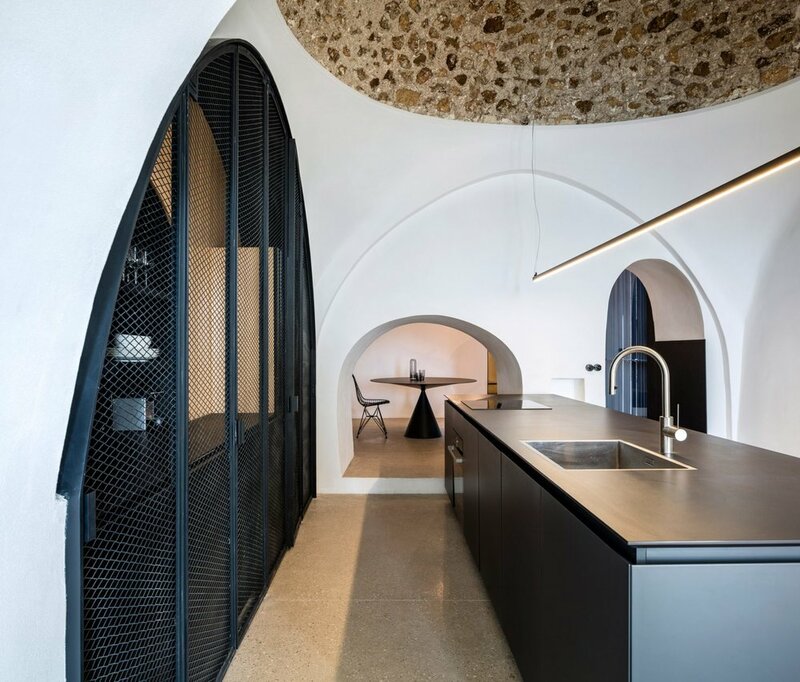 This firm has renovated several ancient buildings into modern dwellings, combining the old with the new. I really like this firm’s work. 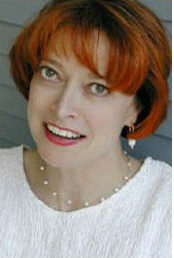 Granted it is not for everyone, since most of their work is contemporary, modern and often very zen-like. 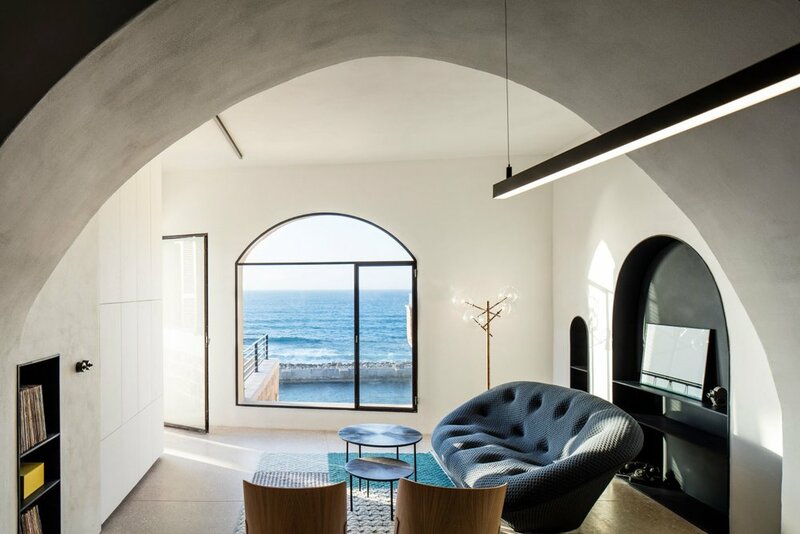 In Jaffa they took an old building and renovated it into a modern home which very much fits into today’s way of life, and preserves the past at the same time. While not everybody could live in a sparse place like this, it does speak of history with its exposed, old vaulted ceilings, arches and stone walls. Much suited to Israel’s climate and culture though, I think. Two images of the Jaffa House by Pitou Kedem Architects. Note the Charlotte Lancelot rug in large cross stitch style in the upper photo . Below are images of another updated home in old Jaffa, also by Pitsou Kedem Architects. You can see the signature emerge of this firm. Clean lines, sparse but powerful details and a firm respect for the old integrated with the new. This building is located near the Mediterranean Sea and the architects have kept the apartment’s spaces open to allow for easy flow within the structure as well as keeping the vistas to the Med open. Uneven floors due to multiple additions over the centuries were brought to the same level, and arched windows and doors were added to reflect the arched ceilings. Old Jaffa - Design by Pitsou Kedem Architects. White plaster smoothes out the ancient walls, black tin lining in the alcoves contrasts sharply with these walls as do the doors and windows. The domed kitchen ceiling was cleared of years of plaster to expose the ancient stone. Again, not for everybody, but certainly well proportioned and striking. And with the blue Med rolling in under the window, I could live in a place like this. You? In Tel Aviv interior designer Mayaan Zusman renovated a small apartment for a young family with two children. In order to create three bedrooms and two bathrooms she used storage modules and a solid divider separating the apartment in two halves, guaranteeing privacy and acoustic separation as requested by the client. The kids bedrooms, bathroom and entry are in one half of the apartment, whereas the master bedroom and family spaces are in the other half. Clever storage units are to be found throughout the apartment. White walls and light coloured wood flooring provide a sense of calm. I discovered the Israeli designer Ron Gilad a few years ago. Gilad trained in industrial design in Jerusalem and has since moved to New York, where he opened up his studio Designfenzider. Gilad is a highly respected designer who has an eye for the unusual. He is probably best known for the chandelier called Dear Ingo. Dear Ingo is available in a 6 to 16 lights fixture. As an LED chandelier it adds a certain presence to a room. At a minimum it is a conversation piece. The fixture is made up of a number of desk lamp styles which as a chandelier looks like a gigantic spider. Take a look below. Ron Gilad’s Dear Ingo Chandelier. The chandelier with its multiple lamp options can be used as an ambient light fixture over a dining table or as task lighting in an office or atelier. For someone to think of this is quite interesting, right?! Really different. And than there is his day bed. Now you would think a bed is a bed is a bed. But not for Gilad. When he designed his 56 Day Bed, rather than adding more conventional style legs, Gilad used the Thonet chair style as means of support. Every time I see this photo I wonder how those four rather delicate chairs hold the bed with mattress. Gives a different meaning to the word bed don’t you think? I particularly like the minimalist 3D frame Gilad designed to showcase and highlight individual objects (see below). My sense of aesthetics really relates to the overlapping of the lines of the flowers and leaves over the frame. You could use a frame like this to display anything, as long as it fits the frame. It could be a photograph, an object that means a lot, a candle, a piece of jewelry, a drink (wink, wink) or a set of books you are reading. I can so see a Renaissance bouquet of flowers within this frame. Having a frame to highlight a moment in your life by using a 3D frame like this is quite meaningful. It becomes a fluid thing, a usable thing. Don’t you think? Or what about Gilad’s hugely oversized hand mirror, one in a series of nine? Surely that brings a smile to your lips? Or a wink to your eyes? There is not enough room to address Israel’s many accomplishments in architecture and design in one small blog. So I am going to conclude this post with a quick visit to the Israel Museum in Jerusalem followed by Eilat in the very south. I am not finding the architecture of the museum something to be lyrical about. However, the design of the building is meant to enhance visitor experience. The museum is ranked as one of the leading art and archaeological museums in the world. It was founded in 1965 and it includes artifacts and works from prehistoric times to the present. One of the important parts of the museum is the Shrine Of The Books which holds the Dead Sea Scrolls. Another great permanent exhibition is the Synagogue Route. The Synagogue Route displays the original, reconstructed interiors from old synagogues in three different parts of the world: South America, Europe and Asia. “The diversity in their architectural styles reveals the direct influence of the local surrounding culture, and the character of each community.” says the museum. Above an image of the original Tzedek ve-Shalom synagogue from Paramaribo in Suriname as reconstructed in the Israel Museum. This interior dates back to the 18th century when Spanish and Portuguese Jews left Europe for a new life. Suriname was a colony of the Netherlands in those days. Today Suriname is, of course, independent with strong ties to the Netherlands. The dark tropical wood contrasts sharply with the white canvas of the space itself giving the interior strong definition. The Kadavumbagam synagogue below heralds from the town of Cochin in southern India. It was built in the 16th century as a wooden structure, with an exquisitely carved and painted ceiling influenced by the decorations of mosques and Hindu temples (as per The Israel Museum). And so I have come full circle, from too many tourists to too many tourists.